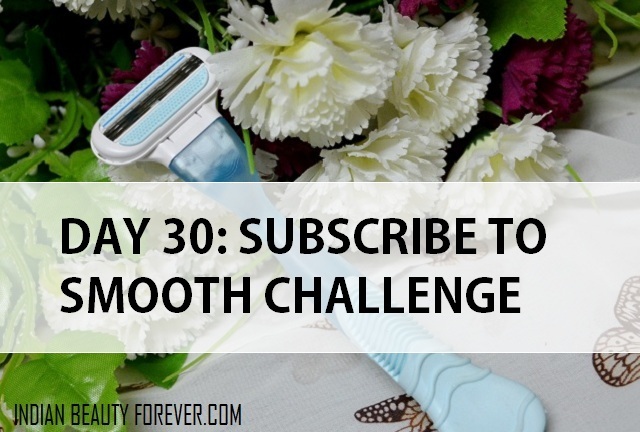 This is the day 30 of the "Subscribe to Smooth" challenge. I liked Gillette Venus and it’s my short cut to get smooth hair free skin instantly since for me who doesn’t get time these days to get waxing done, shaving is the best thing to get rid of the unwanted hair. I have used hair removal creams as well however, the foul smell that most of them would emit along with the waiting time is not for me therefore my preferred mode of quick hair removal is shaving. But I would also like to let you know that when you shave or even get the waxing done then you must make sure that you properly exfoliate. Do that almost every day with a loofah to get rid f the dead skin cells else the ingrown hair problem can be there. For me a single blade of this Gillette Venus lasts for about 1 month before I change it. The razor handle is like a onetime investment therefore I don’t have to repurchase it if I don’t loose it. Other than that I find this method to be cheaper and far easier which saves time. Having said that, I still like to get waxing since that gives hair free skin for a least a month therefore, I like that too but for girls who got sensitive skin that gets rashes after waxing, they should try this or those who find waxing to be painful. Earlier even I used to think that this shaving can make the skin darker but that’s not true, now, I know that the darkening was due to skipping sunscreens. Rather, shaving removes the dead skin layer over the skin. So, what do you think? Do you like this method? With regular and proper exfoliation I think this is a easy and painless way to smooth skin.